Directions(6-10): Study the following information carefully and answer the questions given below. Rahul, Raman, Ravi, Rohan, Rohit, Roshan, Rounak and Rockey, eight students go to take admission in “International School of Language Learning” to learn different languages. Each of them likes a different language,i.e, German, Spanish, Portuguese, Chinese, Hibru, Arabic, Italian and English. But not necessarily in the same order. In the off time they are sitting around a circular table. All of them are facing outward from the centre. >> The person who likes German, sits on the immediate left of the person who likes English. >> Rounak sits on the immediate right of Rockey and does not like Hibru. 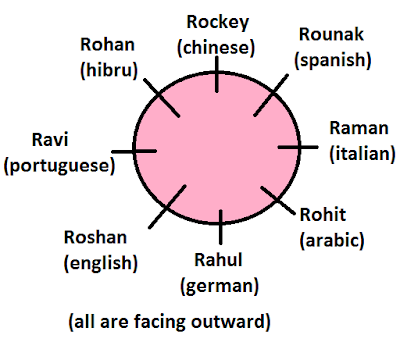 >> Rohit and Rounak are not immediate neighbours of each other. >> Rohan likes neither Italian nor Arabic. >> Rahul sits second to the right of the person who likes Italian. >> Only one person can sit between the persons who like English and Arabic. >> Only two persons can sit between the person who likes Arabic and Ravi. >> The one who likes Hibru sits second to the right of Roshan. >> Raman and Rohit are immediate neighbours of each other. >> Ravi who likes Portuguese and Rahul are not immediate neighbours. >> Rockey is an immediate neighbour of the one who likes Hibru and likes neither Spanish nor German. >> Only two persons can sit between the persons who like Italian and Hibru respectively. 6. Who sits opposite to Rahul ? 7.Position of Roshan with respect to the person who likes Arabic ? 9. Who sits immediate left of the person who likes Italian ? 10. Who sits between the person who likes German and Ravi ?